This is quite a shocker to me. I thought what with all the professional AIDS advocacy and service organizations in New York, not to mention the hundreds of world-class researchers and hospital workers informed about all HIV prevention tools, including use of cocktails, the last place I'd read about a gay man exposed to HIV and denied emergency treatment would be out of Manhattan. Mt. Sinai On Friday, July 5, a gay man who feared he’d just been exposed to HIV, the virus that causes AIDS, went for treatment to the Emergency Room at Manhattan's Mt. Sinai Hospital. He needed PEP (Post Exposure Prophylaxis), a treatment shown to be very good at stopping the virus, if treatment starts quickly. And Mt. Sinai's Emergency Department has PEP. Despite this -- with the clock ticking -- Mt. Sinai not only REFUSED him treatment but denied that such a thing existed and demanded he leave the hospital! How could this happen at a prominent teaching hospital in a major medical center? Demand Mt. Sinai do its job! Mt. Sinai is not alone. There are several reports of delays or refusals by other NYC health care providers in getting PEP to those who need it. The NYC Department of Health's Bureau of HIV AIDS is doing a lousy job of getting the word out about this important tool of HIV prevention. ACT UP is watching. 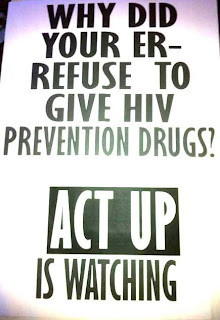 ACT UP got the call from the man who feared he'd been infected, made sure he got to a hospital quickly, and heard from him about how he was denied treatment at Mt. Sinai. 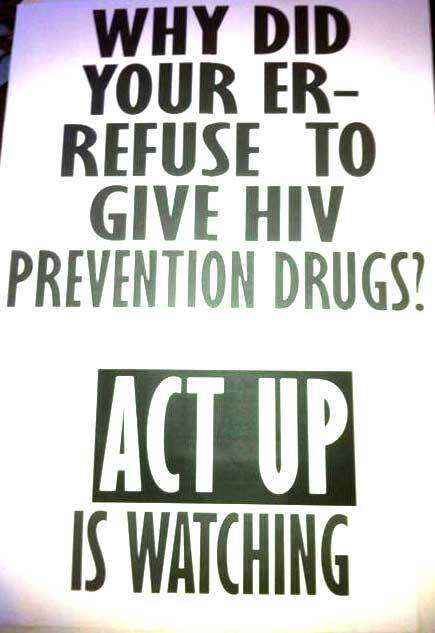 ACT UP is keeping track of these incidents and holding hospitals and government health officials accountable.